Lobomycosis is a rare chronic fungal infection of the subcutaneous tissue found in South America, mainly in Brazil. It is caused by Lacazia loboi. Its clinical manifestations are dermal nodules, either lenticular or in plaques, and keloidlike lesions that can resemble nodular leprosy or leishmaniasis, other subcutaneous mycoses (sporotrychosis, chromomycosis, paracoccidioidomycosis), keloids, and malignant tumors. Lobomycosis is a chronic, granulomatous, fungal infection of the skin and subcutaneous tissues that was first described in 1930 by Jorge Lobo in Recife, Brazil, as keloidal blastomycosis. The patient was a 52-year-old Amazonian man who presented with multinodular keloidlike lesions in the lumbar region. In the following years, other cases were identified in Brazil and reported as “Jorge Lobo–type blastomycosis,” pseudoleprous Amazonic blastomycosis, or leprosy of the Caiabi (a Mato Grosso tribe especially affected by the disease). The etiologic agent responsible for Lobo disease was initially classified as Glenosporella loboi by Fonseca Filho and Area Leão in 1940; however, the fungus nomenclature has been one of the most controversial aspects among mycologists, thus other proposed names include Glenosporopsis amazonica, Paracoccidioides loboi, Blastomyces loboi, Loboa loboi, and Lobomyces. Although important advances have been made through the use of updated molecular biology techniques, the etiological agent of lobomycosis has been impossible to culture. In 1999, Taborda et al proposed the agent in a new genus,Lacazia, calling it Lacazia loboi. The disease has been diagnosed generally in tropical areas.Most patients have been diagnosed in the Amazon basin and countries of Central America. There is no ethnic predominance, as all races appear to be equally susceptible. The age range of patients at the time of diagnosis is between 40 and 70 years. Their clinical evolution suggests that clinical manifestations begin many years before. In children there are a few reports. There is a clear gender predilection, as 90% of cases have been reported in men. This is most likely related to occupational exposure; however, in the Amazonian Caiabi Indian population, the prevalence in women reaches 32%, probably as a consequence of their role in agricultural and forest activities. 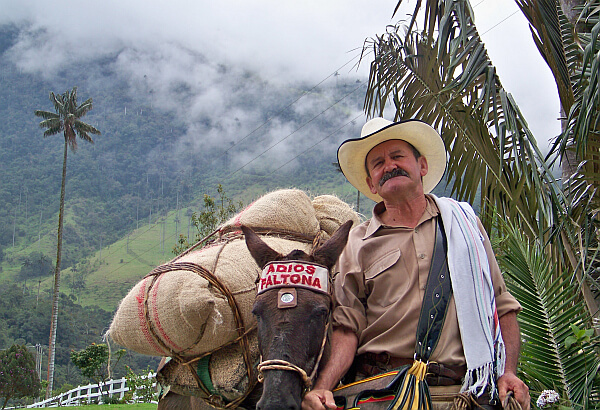 Farmers exposed to harsh conditions and aquatic environments represent most of the reported cases. Other high-risk activities include gold mining, fishing, and hunting. Patients often report a bite or sting from an arthropod, snake, or stingray, or trauma from a cutting instrument. Lacazia loboi probably has a saprophytic phase in vegetation, soil, and water, which would explain the disease in aquatic mammals, such as the dolphin. There are no reports of person-to-person transmission. Lobo disease is characterized by pleomorphic lesions. These may occur as variably sized dermal nodules, either lenticular or in plaques (which can be either hyper- or hypopigmented. The lesions are generally painless, although pruritus and dysesthesia have been occasionally described. Different types of lesions may be seen at various stages of disease progression. Infiltrative lesions are often a feature of early disease and can simulate tuberculoid leprosy or burn scars. Ulcerative lesions may represent advanced disease, and on healing result in sclerotic or atrophic scars. Most of the ulcerated lesions are caused by trauma. Patients usually present with lesions of various types. The patients usually complain of functional disability and disfigurement. The disease generally does not affect the epidermis, and therefore skin lesions usually have a smooth and shiny appearance. Fine telangiectasia may be seen. Some lesions, especially on the lower limbs, can be keratotic and vegetating. Any area of the body is potentially susceptible, as infection commonly follows trauma; however, the most commonly affected sites include the legs, the outer ears, and the arms—the disease is usually unilateral. The head, back, face, thorax, and lumbo-sacral region may also be affected. Local spread probably occurs in part by autoinoculation, causing small satellite nodules at the periphery of the mother lesion. Regional lymph nodes can be involved. This involvement varies from less than 10% to more than 25%.Distant skin lesions probably occur because of lymphohematological dissemination. Cutaneous dissemination can result in confluent lesions and plaques, with some patients developing hundreds of lesions. It has been described that the chronic nature of the lesions, with repeated trauma and chronic ulcers, predisposes affected patients to the development of squamous cell carcinoma, with a low cure rate. The clinical diagnosis is apparent to physicians who have seen previous cases of lobomycosis and the patient is known to reside in an endemic area. Laboratory diagnosis is based on the macro- and microscopic examination of lesions. Direct examination of a skin smear permits visualization of the parasite, which is abundant in lesions. It is quick and easy and entails scraping a tumoral lesion with a scalpel blade to obtain dermal tissue for microscopy with KOH. Lobomyces are yeastlike organisms that are round or oval and measure 6 to 12 μm in diameter and occur isolated or in chains of 2 to 10 cells, which are connected by short tubular projections and usually have a birefringent membrane. The histological picture is pathognomonic, being characterized by the presence of a live agent granuloma consisting of a dense histiocytic infiltrate with multiple epithelioid and multinucleated giant cells that can be seen phagocytizing the fungal bodies. The epidermis is usually atrophic, although it can also be hyperplastic, vegetating, and keratotic. 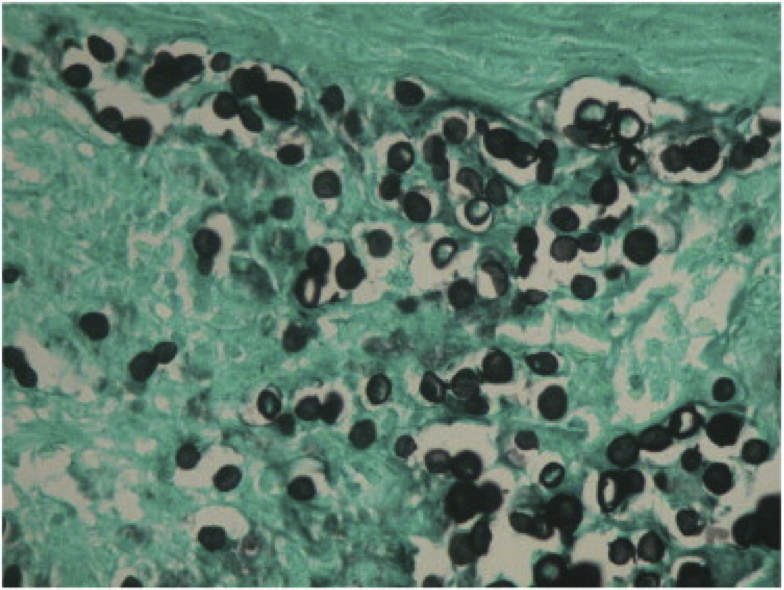 The fungi within the histiocytes and multinucleated cells are clearly distinguishable by periodic acid-Schiff, Gomori/Grocott, or Gridley silver stains. Disease spread to the lymph nodes produces a similar inflammatory infiltrate with histiocytes and multinucleated giant cells. The cytoplasm of these cells is often xanthomatized and contains the same abundance of yeast cells as in the dermis. 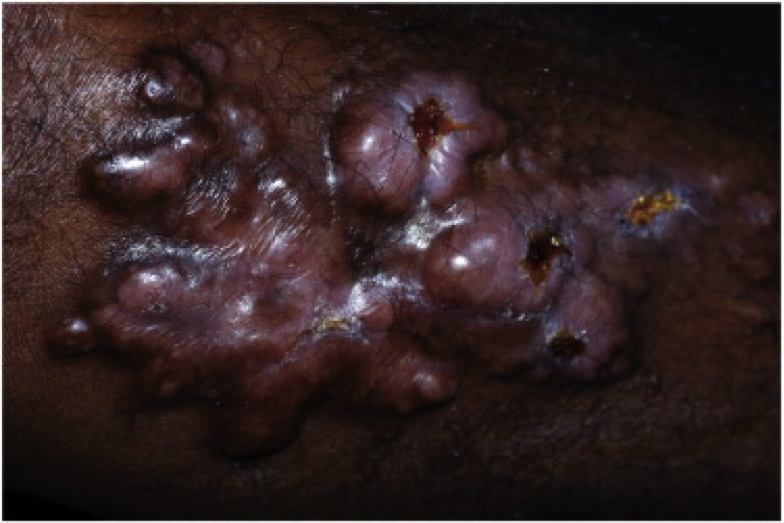 Because of its great clinical variation, lobomycosis may include the following diseases among its differential diagnosis: keloid; leprosy, including borderline tuberculoid (BT) leprosy; mucocutaneous leishmaniasis, mainly its cutaneous diffuse anergic form; cutaneous tuberculosis; paracoccidioidomycosis; histoplasmosis; chromoblastomycosis; sporotrichosis; mycetoma; phaeohyphomycosis; blastomycosis-like pyoderma; Kaposi’s sarcoma; sarcoidosis; keloidal forms of scleroderma; Ehlers-Danlos type IV syndrome; the sclerotic form of disseminated xanthoma; non-Langerhans cell histiocytosis; benign neoplasias of nodular expression; melanoma and non-melanoma skin cancer; dermatofibrosarcoma; lymphomas, especially mycosis fungoides, and cutaneous metastases. Lobomycosis. Literature review and future perspectives. November 2009. Some investigators have reported the importance of immune response patterns related to the clinical presentation of subcutaneous mycoses such as chromoblastomycosis and Jorge Lobo's disease. Clinical forms of chromoblastomycosis have been associated with the occurrence of an in situ immune response with a differentiated profile of cytokine expression. In Jorge Lobo's disease, has been suggested the presence of cellular immunodeficiency despite the occurrence of lesions predominantly consisting of macrophages and giant cells phagocytosing a large quantity of fungal structures. On the other hand, there are no studies reporting aggravation or dissemination of lesions in cases associated with severe cellular immunodeficiency such as patients with HIV/AIDS. 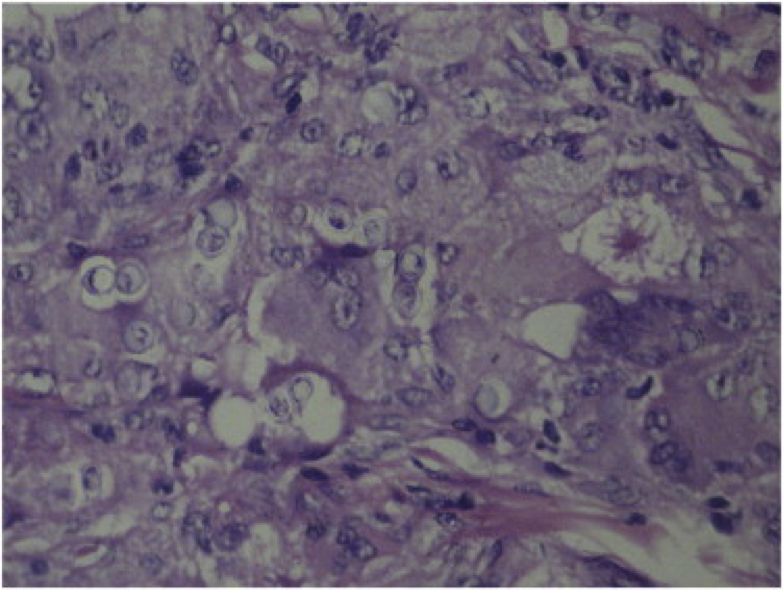 Despite this histologic feature which partly demonstrates the effectiveness of the macrophage-mediated immune response, comparison of the CD68 immunolabeling intensity between cases of Jorge Lobo's disease and tuberculoid leprosy revealed less intense labeling in Jorge Lobo's disease, implying lower metabolic activity in these cells. In addition to this weak immunolabeling of macrophages, reactivity to TGF-β was higher in Jorge Lobo's disease than in control cases of tuberculoid leprosy and similar to that observed in cases of lepromatous leprosy. The immunosuppressive activity of TGF-β has been demonstrated in different models of infectious diseases. Its ability to induce apoptosis of immune cells as well as to inhibit the cellular immune response has made TGF-β a determinant marker of susceptibility to chronic and acute infections such as leprosy, chronic hepatitis, and yellow fever. The intense immunolabeling for TGF-β observed in cases of Jorge Lobo's disease may explain in part the weak reactivity to CD68, as TGF-β is able to strongly inhibit macrophage activity, reducing the microbicidal efficacy of these cells. Macrophages are known to play a central role in the immune response to infection caused by various microbial agents such as mycobacteria and fungi. The microbicidal capacity of these cells is centered on the production of lytic enzymes by lysosomes that act on phagocytosed microbial agents. The present data showed low cellular activity for a lysosome marker, that is, CD68, with weak reactivity in Jorge Lobo's disease. This finding may indirectly indicate a low efficacy in the activation of macrophage microbicidal factors, probably due to the activity of TGF-β . The expansion of collagen areas observed in lesions from Jorge Lobo's disease calls attention to the ability of TGF-β to induce fibrosis in certain chronic infectious diseases such as hepatitis. In the skin, TGF-β plays a critical role in the regulation of extracellular matrix gene expression. Its overexpression is believed to contribute to the development of tissue fibrosis. 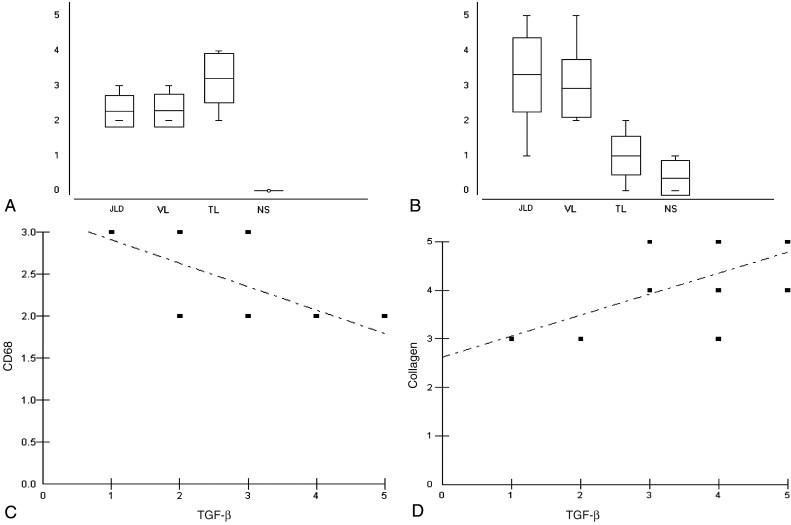 Is TGF-β important for the evolution of subcutaneuos chronic mycoses? No antifungal has been shown to be effective against Lacazia loboi yet. The optimal treatment for localized lesions is wide surgical excision, electrocauterization, or cryosurgery, ensuring that margins are free of the disease to avoid recurrence. It is worth noting that instruments contaminated during operation can lead to reinfection. The only treatment of choice for disseminated infection is chemotherapy. Clofazimine, with dosages of 100 and 200 mg daily, has been used in some studies, as it has shown efficacy with a variety of fungi and actinomycetes and has anti-inflammatory properties in processes involving foreign body granulomas. Therapy with ketoconazole, amphotericin B, trimetoprim-sulfametoxazole, sulfadimetoxine, and 5-fluorocytosine have been disappointing. Dudok Van Heel successfully treated a dolphin with lobomycosis with myconazol, which seems to be the only case of an apparent radical cure with the use of a chemotherapeutic agent both in cetaceans and humans. Itraconazole has shown to be partially effective and has been used as adjuvant to prevent recurrence of surgically extirpated lesions. In the dawn of molecular medicine, lobomycosis remains an obscure, emerging disease in humans that presents challenges that should stimulate research in its etiopathogenesis and transmission, as well as in the development of more effective treatment.